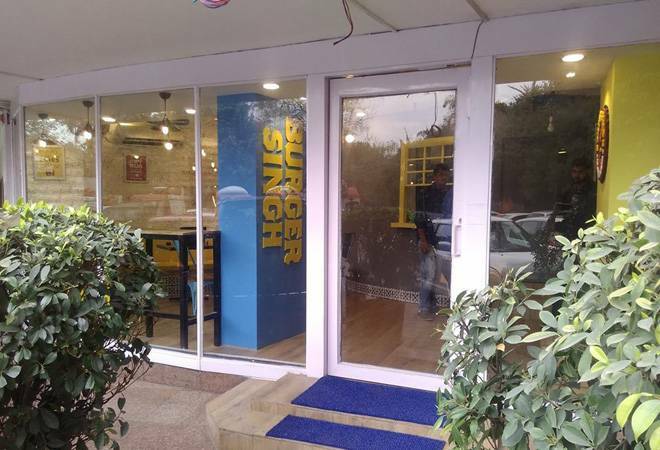 From just the National Capital Region (NCR), Burger Singh has now opened up outlets in Dehradun, Nagpur, Pune, and Jaipur. Two stores in London, as well. The company sells over two lakh burgers a month. A couple of years back, few would have given much thought to Burger Singh, a company whose name is phonetically close to Burger King, but whose identity is distinctly "Made in India" . Selling burgers called Chotu Singh, United States of Punjab, Bunty Pappeh Da Aloo, Amritsari Murgh Makhani, Bihari Gosht, Malabar Express; a drink named Tony Pappeh Da Jeera Soda, dips such as Tandoori White Guy Mint, and deserts like Mittha Singh, the company makes nearly Rs 3 crore a month from 26 stores at the moment. From just the National Capital Region (NCR), Burger Singh has now opened up outlets in Dehradun, Nagpur, Pune, and Jaipur. Two stores in London, as well. The company sells over two lakh burgers a month. In a market dominated by American chains such as McDonald's and Burger King, how did an Indian brand cut it? Burger isn't a very complicated product-after all, it is just a patty between two buns-but its supply-chain can be quite complex. Turns out, Burger Singh has done a reasonable job on this, and a few more. The last mile cooking happens at the stores but the inventory such as patties is made by food processors based in Punjab. The inventory is first dispatched to a master warehouse before reaching the stores, once every week. This process isn't very different from what other burger companies do. However, Burger Singh has done better in last mile delivery, founder Kabir Jeet Singh says. Burgers are difficult to deliver to home because the buns, especially the lower bun, can get soggy and disintegrate real fast. Singh worked with food technologists to create "moisture barriers" that prevents juices from the patty and sauces slipping into the bun. The company also invested in its own delivery fleet-about 70 delivery boys, specifically, carries out late night deliveries. While it could have outsourced the delivery to a third party services provider, late nights, Singh realised, are tricky. His customers would have had a few drinks by then and any delays would make them impatient. A delivery fleet under direct control works out better. Of course, Burger Singh prices its burgers and drinks in a sweet spot. It has "under Rs 100 specials" although the more exotic variety could be twice as costly. "We are after the snack market," Kabir Singh says. "It is about grabbing a quick bite." The average ticket size, which includes a burger, a drink and fries, is under Rs 300.